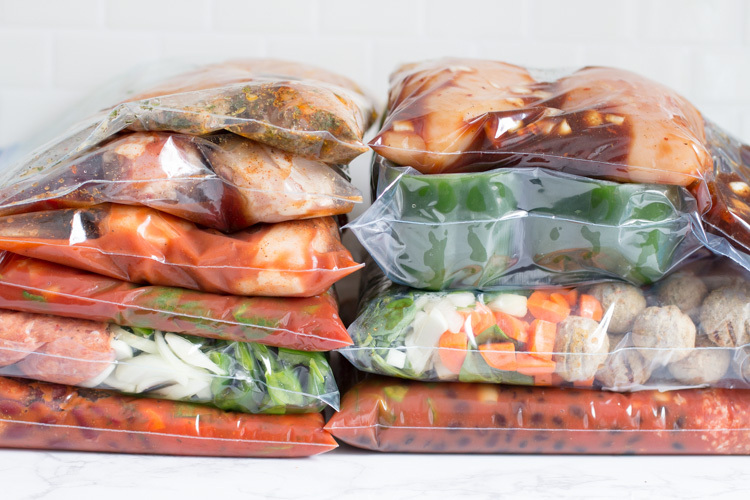 When is the best time to make freezer meals while pregnant? Making freezer meals for new moms aren’t any different than the types of freezer meals that you would make for anyone else. 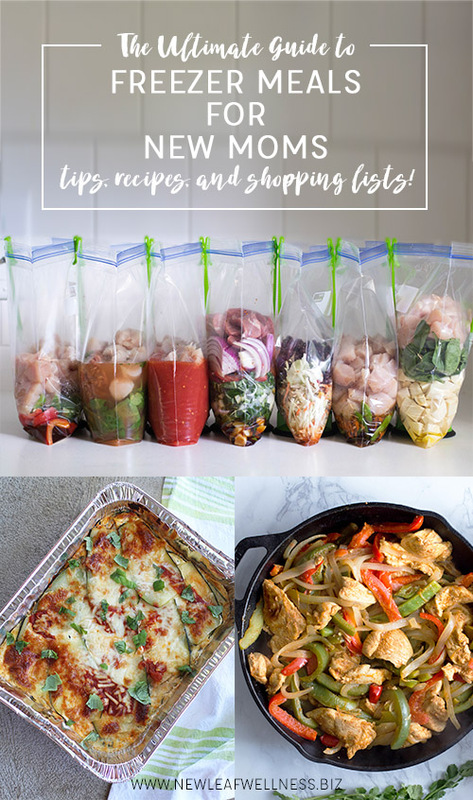 (Here’s a good list of 31 freezer meals prep sessions that I’ve done in the past that include the free printable recipes and shopping lists.) The only difference in making meals for after birth is that you might want to include more variety. For example, when I’m making freezer meals for myself I like to double or triple recipes to save time and money because we have no problem repeating meals before they expire. BUT, when I’m prepping a batch of meals to eat in a row right after a new baby arrives I don’t want to eat the same thing every night. A mix of tastes, textures, and even cooking styles is key (crockpot, oven, skillet, etc.). 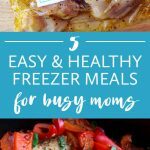 40 Pre-Baby Freezer Meals – these were the meals that I made while pregnant with Baby #4 and was feeling like a total over-achiever. I made 15 beef/pork crockpot freezer meals, 15 chicken crockpot freezer meals, and 10 casserole-type meals. We ate like kings after our son was born and loved every second of it. 27 Pre-Baby Freezer Meals – these are the meals I made while pregnant with Baby #3. The blog post doesn’t contain a full shopping list, but there are some good tips and it shows the process of stocking your freezer. 12 Freezer Meals in 2.5 Hours – these are the meals that I made for my friend Heather when she was pregnant. I picked six recipes that I thought her family would like and doubled them so we could keep six for us. 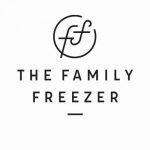 How I Stocked My Freezer Before Baby – this post was written by my friend Denise at Sweet Peas and Saffron when she was pregnant with her second son. I love that she made such a variety of recipes – soups, breakfasts, muffins, snacks, etc. Tips, Tricks, and Recipes for a Stocked Freezer Before Baby – this is how my cousin Jacquie stocked her freezer when she was pregnant with her third daughter. I just love all of her details and tips. 7 of My All-Time Favorite Crockpot Freezer Meals – these are sure to be a big hit with anyone. 30 Meals in 3 Hours from Costco – this would be an easy way to stock your freezer for a long time. 8 Freezer Meals in 90 Minutes – includes my favorite meatloaf recipe. 5 Vegetarian Crockpot Freezer Meals in 50 Minutes – perfect for vegetarians. 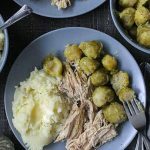 10 Gluten-Free Dairy-Free Crockpot Freezer Meals in One Hour – I loved these meals and they’re perfect if you’re worried about eating dairy while nursing. 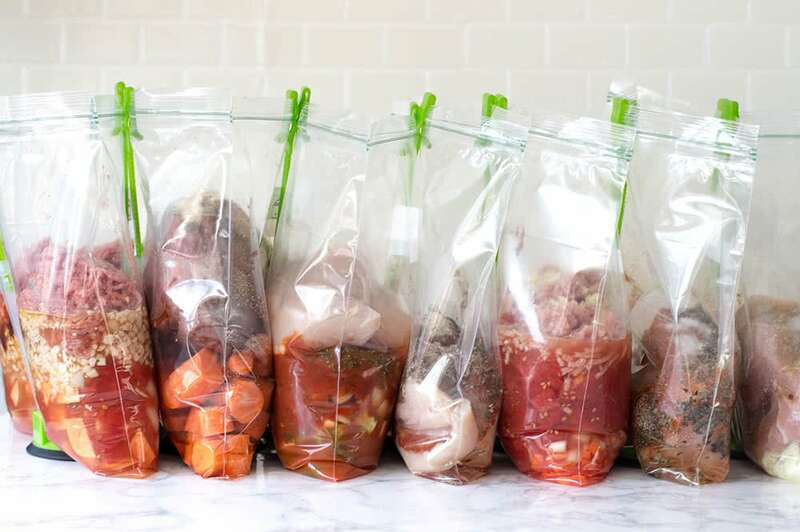 10 Whole30 Crockpot Freezer Meals in 90 Minutes – These meals are all really delicious. If you don’t want to make all 10, I would skip the chicken enchiladas and Tuscan chicken stew. Prep Session Tips. This blog post contains my seven best tips for a big freezer meal prep session. Enlist help if you can. I’ve made a lot of freezer meals with my mom and it’s a lot of fun. Side Dishes. I always like to consider side dishes and how to make my freezer meals into complete meals. Stocking up on frozen garlic bread, frozen veggies, and microwaveable rice packs are great options. Thank you!! I’m currently pregnant with Baby #1 and am looking forward to stocking our freezer with a variety of meals! My mom, Grandma and I did a “trial run” of freezer meals with a bunch of casseroles and are now enjoying the efforts. 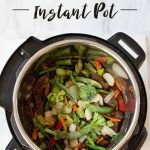 Next up we plan to do a bunch of crockpot meals and I’ve sent them both the link to your website! Looking forward to making a list and getting started! Thanks always for the inspiration! How exciting! Best wishes for the rest of your pregnancy, Lindsay.